Easton (population 373) is located in west-central Illinois about 35 miles southwest of Peoria and 30 miles northwest of Springfield. Illinois Route 10 meets County Highway 21 at Easton. The town was platted in the center of Mason County. Samuels Ditch flows to the west of town while Ross Tyrell Ditch flows to the east. The Illinois Central Gulf Railroad runs through town on a northwestern angle. Research and information is needed on the history of Easton and its school system. It is probable that Easton began an educational system for its children in the late 1800s. 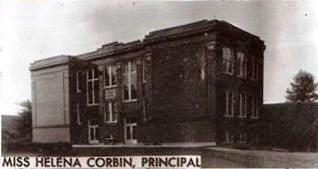 The high school served the town's children for over eight decades. It was in the late 1980s that consolidation efforts got the best of Easton High School. After the 1988-89 school year the towns of Easton, San Jose, and Mason City combined forces to form a new school district. The new district was called the Illini Central School District. 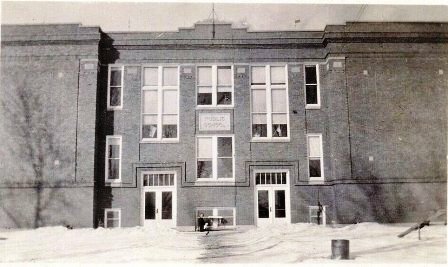 The high school and a grade school were located in Mason City. 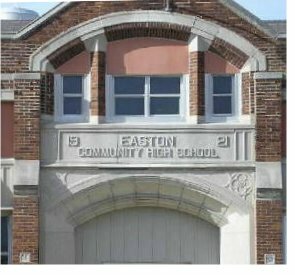 Easton was able to maintain a grade school in town until the end of the 2006-07 school year. 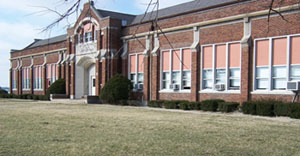 The Illini Central (Easton) Grade School was held in the former Easton High School building until that time. The former Easton High School building was recently sold and is intended to be used as a factory. Thank you to Josh Ebbert for this bit of information. Holly Birch advises the Easton High School gymnasium building may still be used when needed for events by the Illini Central School District. Easton High nickname: the "Hawks"
School Fight Song: "Easton Loyatly"
We're loyal to you Easton High. We're Purple and Gold, Easton High. For we know you have sand, Easton High. So crack out the ball, Easton High. We're backing you all, Easton High. Victory from you Easton High! Dear Alma Mater, EASTON HIGH! Easton High School offered boys sports for many years and joined all other Illinois schools in the early 1970s by offering girls sports. The boys competed in basketball, track, and possibly baseball. The girls played basketball, volleyball, and track. Conference affiliation, great teams and coaches, all are items needed for this page. We are told that many of the trophies and a great many pictures of Easton High School's storied past are available for viewing at the Easton Fire Hall. The Lady netters of Easton High had a couple of seasons to remember. The 1986-87 year was a magical one indeed. The girls volleyball team of that year finished SECOND in the IHSA Class "A" Volleyball Tournament. The girls made one other Sweet 16 appearance and won Regional Championships in three other seasons including 1988-89, the school's last. Only the 1986-87 school year has information on it. Information is needed on the other great Easton teams and coaches as well. The boys basketball team of Easton High School held there own for several seasons as well. The program produced nine District title teams with one of those teams moving on to win the Regional Championship also. There is very limited information available on the IHSA website (www.ihsa.org) regarding the many great seasons of Easton High basketball lore. We are looking for the team records and coaches names of hte better teams on EHS history. Athens beat Green Valley in title game. EASTON (38): Cunningham 15, Lynn 10, Clark 9, Herman 3, Hovey 1. BACK ROW, L TO R: Paul Jockisch-mgr., Dean Pottorf, John McCoy, Marvin Huber, Dale Phelps, coach Lyle Drake. FRONT ROW, L TO R: Gerald Riegel, Don Hovey, Stanley Cunningham, Richard Lynn, Gene Hermann, Harold Clark. The Hawks won the San Jose Holiday Tournament, the West Central Conference and the Mason County Tournament. 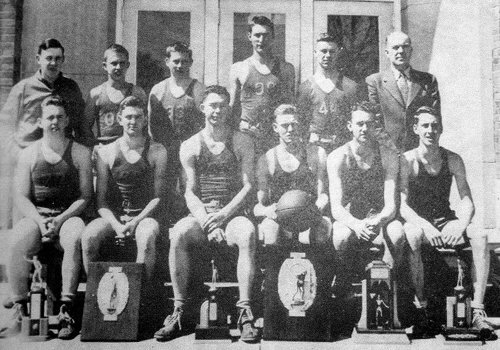 A loss to Ashland on Feb. 9, 1945, was their only blemish on the regular season. They then won the District Tourney and beat Springfield Feitshans (44-40) to claim the Havana Regional. In the Sectional at Pekin on March 06, they bowed out with a 47-38 loss to Peoria Central (1038 students). Coach Drake's boys led the Peoria team entering the fourth quarter, but a 11 point surge by the Lions cost Easton the game. Coach Drake (also principal) was a graduate of Western State Teachers College (now Western Ill. Univ.) and had a Masters degree from the Univ. of Illinois. He was in his eighth year as coach of the 86-student school. His top players were: 6-3 Gene Hermann, 6-1 Stanley Cunningham, 6-foot Richard Lynn, 5-11 Donald Hovey, and Harold Clark. First off the bench was Gerald Riegel. The weekly newspaper, Mason County Democrat, ran this profile of the team just before the conclusion of the season: "Except for Cunningham, the others on the team came from farms in the Easton vicinity, and none had played basketball except in high school. The were drilled in the only department of the game which counts: good shooting from any angle of the floor, combined with a fast break and tight defense. All of the players use one-handed shots for both long and short attempts, and take pride in their defense as well as offense. The team as a whole has averaged 45 points per game, to their opponents 26." 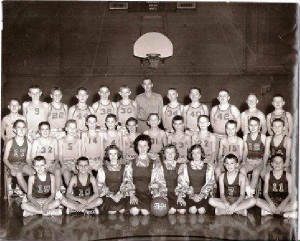 1956-57 23 - 2 Mason County Tourney Champs Coach Ed Reeves. and lost to them in the District tournament. "Green Duck" for the entire season! EASTON: won 6 County Tourney championships and finished second 9 times!!" Two Easton High School tracksters made the trip to the IHSA State Finals brought home some hardware. One "kid", a boy named Holl, won the Class "B" State Championship in the pole vault in 1925!! In 1986, Jerry Payne followed that up with an 8th Place finish in the 800 meter run. 1925B Lyle Roll Pole Vault STATE CHAMPION!! The Illinois Theatre Festival is the largest, non-competitive high school theatre festival in the world. It was organized in 1976 by teachers from the Chicago suburbs. This festival is still going strong as they perform at the University of Illinois (Champaign-Urbana) and Illinois State University every other January. Easton High school participated in this festival in 1978 and 1985. The photos on this page are courtesy of Jon, Jim, and Dan Wheat taken in January of 2006!